Get Ready NY – We are coming your way! With the change in the schedule this year we have absolutely enjoyed a little time for us to get to a show and ride our horses and enjoy a fire on our patio a few evenings but man it went fast. The BOTB is around is right around the corner! 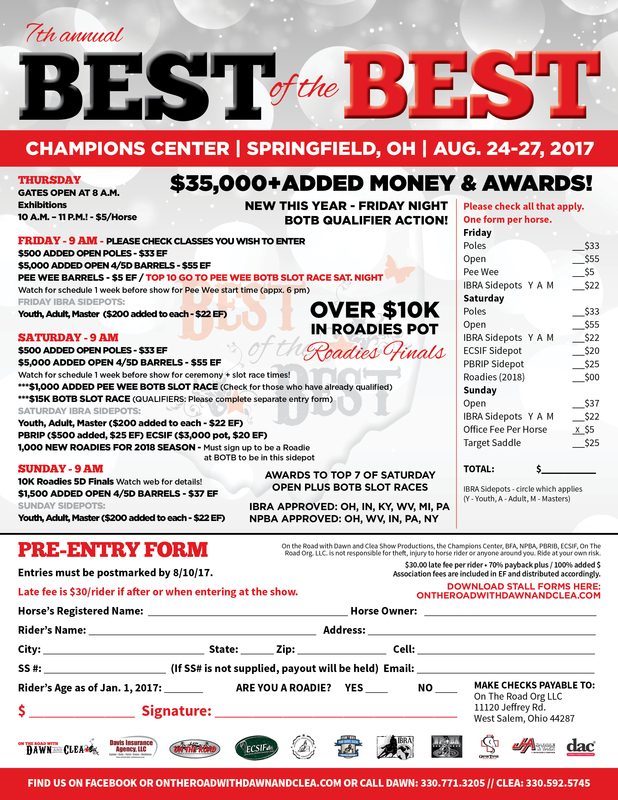 The BOTB Qualifier invites are in the mail (ones we have results for) and we have made a list and checked it twice for The Rebel Soule and are looking forward to seeing our northern friends and those coming from the south to see us and enjoy a weekend in Syracuse. The long alley way and running in the Toyota coliseum at the NY fairgrounds has us more than excited to get there and prepare for our 600+ guest. Although we are both exhausted already we are excited and pumped for the next week ahead of us. Our crew keeps us excited about each and every show. We work those poor bastards to death and the just get more excited for the next one. They can’t wait to see people have meant in the past and make new friends for the future. We can’t thank them enough. And a special shout out to Uncle Al, Momma Lynn and Aunt Carol who have all had a hand in one thing or all in helping with unloading hay and getting the trailer packed for the last week and helping us prepare to leave for 8 days and Momma Lynn for always checking in on Liz and taking care of the farm when we off enjoying our hundreds of guest. We could not and would not be able to do any of this with out The Best Damn Road Crew around. The BOTB stall form and Showbill/Entry form are posted for you to par take as you see fit. As always if you are like every other horse person (like us) half broke and just waiting to get paid to get to the next show, you know how we roll – post date a check a couple weeks out if you need us to hold that check and we will be happy to help ya out. Put a BIG DAMN NOTE on it so we see it! Safe travel to The Rebel Soule and see ya there or On The Road we hope sooner than later. Until then – be kind and have courage! Previous Rebel Soule Schedule, Stalls and Draws are up! Next Thank you Rebel Soule Goers!